Who says you can’t play with your food as an adult? Not me… that’s for sure! 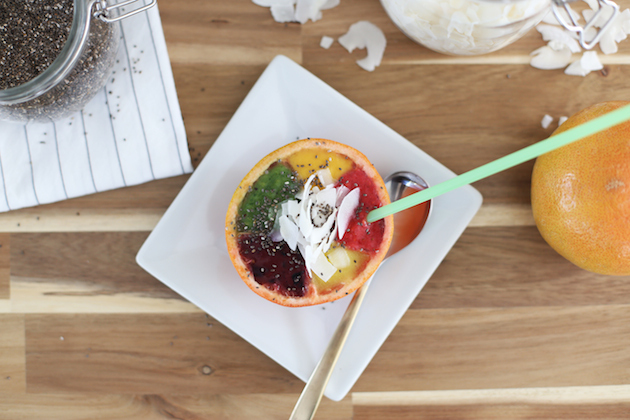 These Rainbow Smoothie Bowls will take you right back to when you were little and it was completely acceptable to play with your food. 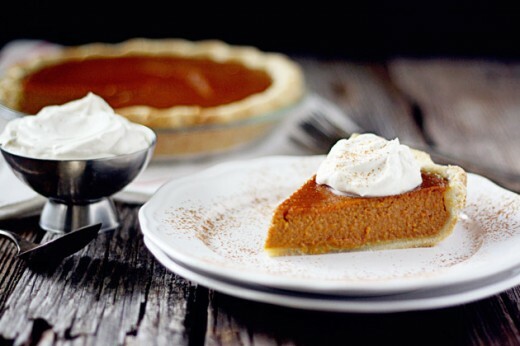 They are delicious, healthy, and so much fun to make. Start by portioning out the ingredients and fruit colors. 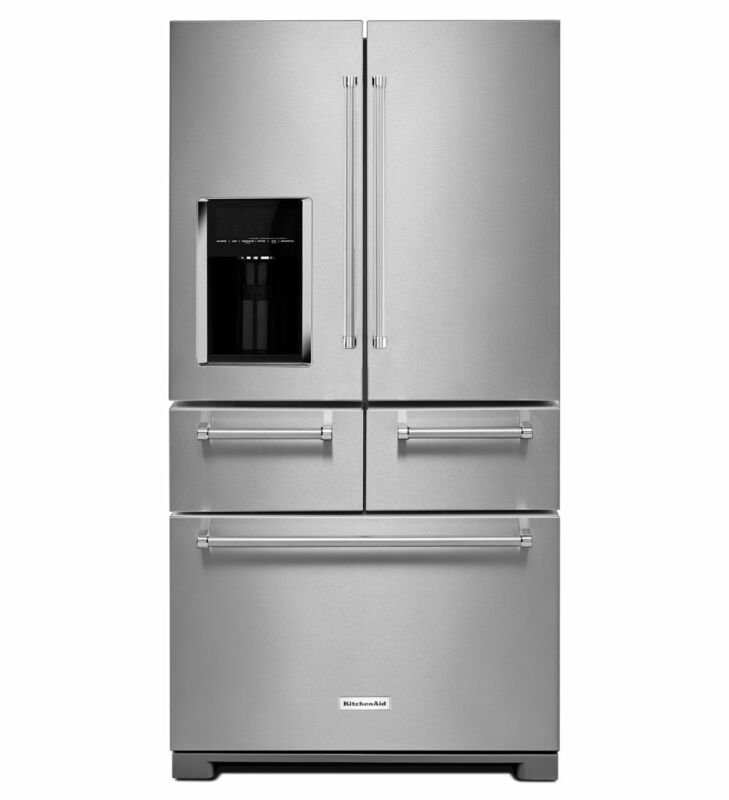 Next, freeze a banana in the freezer of your KitchenAid® Multi-Door Freestanding Refrigerator. I love the Preserva® Food Care System that’s part of this refrigerator. It keeps the refrigerator’s air fresh to delay over-ripening and the freezer’s air dry to prevent freezer burn, so I don’t have to worry about crystals building up on my banana. To create the grapefruit bowls, cut along the pith of the grapefruit to form five equal or almost equal segments. 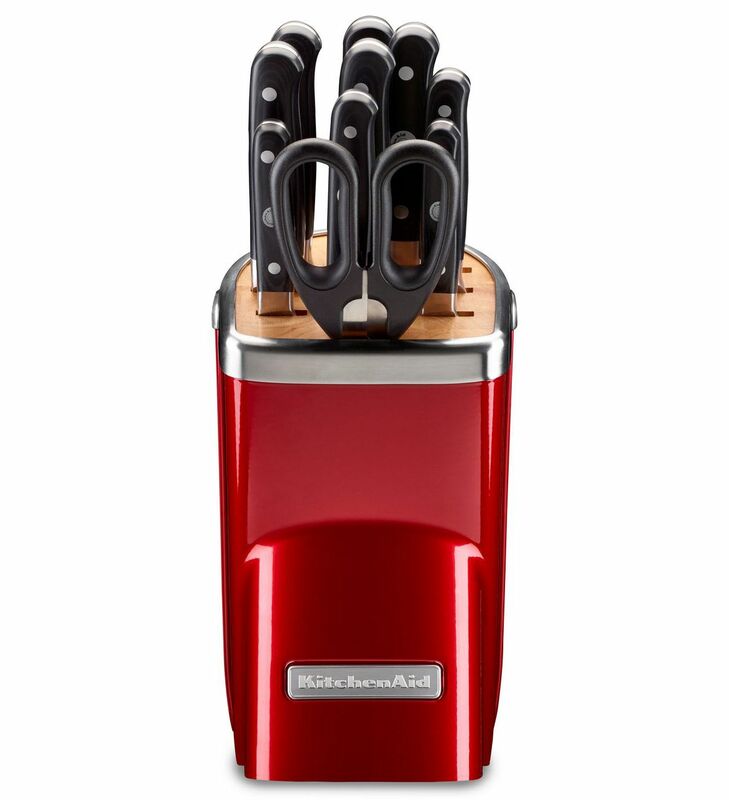 I like to use the Professional Series 5.5″ Serrated Utility Knife from the KitchenAid® 11pc Professional Series Cutlery Set for this task. It works so well. Then make the base of the smoothie. Add the ice, frozen banana, coconut milk, honey, and sweetened condensed milk to the KitchenAid® Torrent™ Magnetic Drive Blender. Blend on the Icy drinks/Smoothies setting until smooth. I love the Adapti-Blend Programs on this Torrent Blender. I can add my ingredients to the pitcher, pick the setting I want to use, and walk away, knowing that when I return, my ingredients will be blended perfectly. Blend each color in this manner. Spoon out each color into the grapefruit. 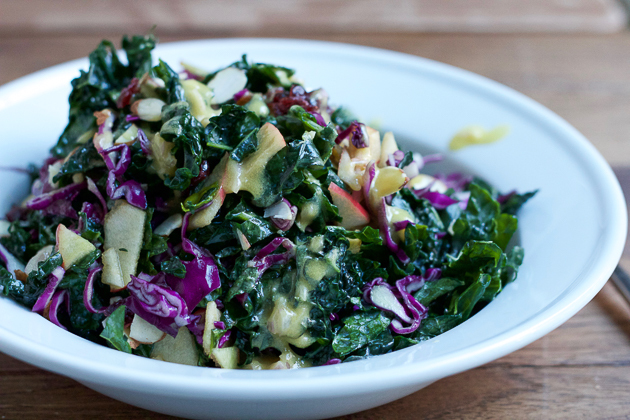 Top with shaved coconut and chia seeds. How easy was that? I’d love to see your ideas for the different smoothie colors. Share your take on this Rainbow Smoothie Bowl recipe with us on Instagram using #MadeWithKitchenAid for a chance to be featured. Before making this recipe, freeze a banana in the freezer of your KitchenAid® Multi-Door Freestanding Refrigerator. 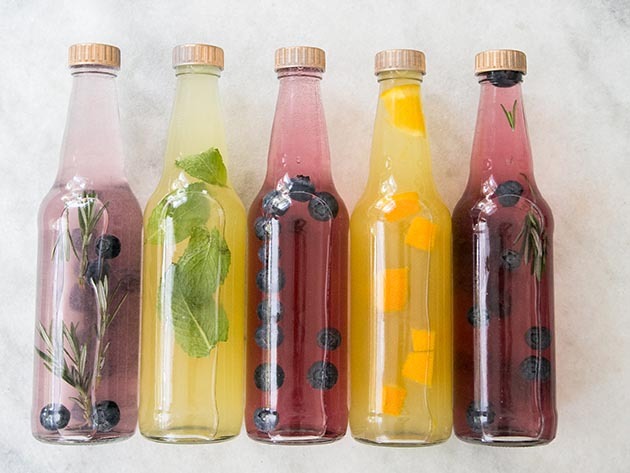 To begin, start by portioning out the ingredients and fruit colors. To create the grapefruit bowls, cut along the pith of the grapefruit to form five equal or almost equal segments using the Professional Series 5.5″ Serrated Utility Knife from the KitchenAid® 11pc Professional Series Cutlery Set for this task. 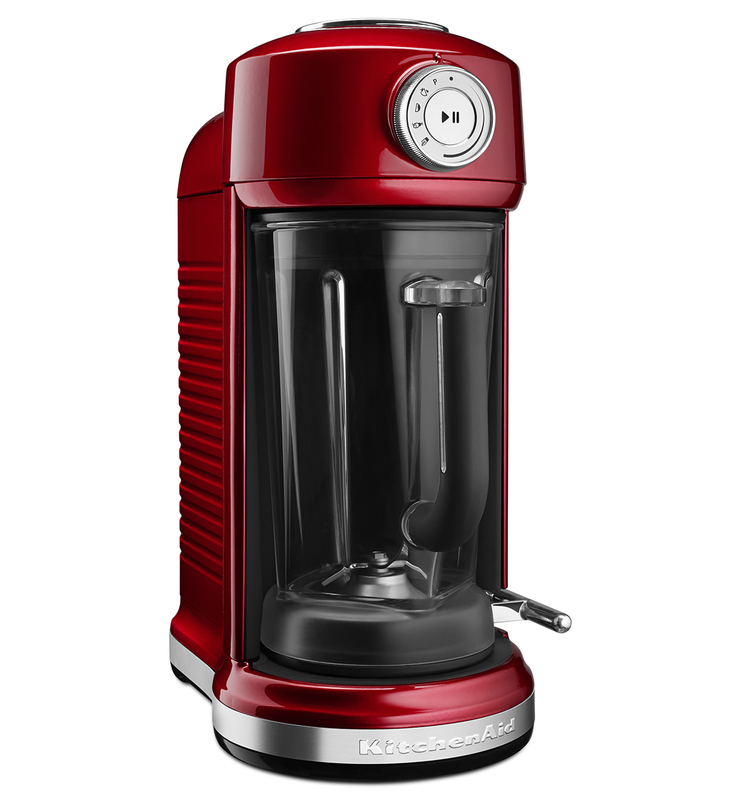 To make the base of the smoothie, add the ice, frozen banana, coconut milk, honey, and sweetened condensed milk to your KitchenAid® Torrent™ Magnetic Drive Blender. Blend on the Icy drinks/Smoothies setting until there are no more lumps. Pour this mixture into a bowl. Add 1 cup of the mixture back into the Blender. Add the fruit for the red smoothie color. Blend each color in this manner. Spoon out each color into the grapefruit. Top with shaved coconut and chia seeds.